Polish extreme metallers HATE have announced the addition of drummer Pawel "Pavulon" Jaroszewicz to the group's ranks. Commented HATE guitarist/vocalist Adam "ATF Sinner" Buszko: "We are proud to inform you that Pavulon has joined HATE as a full-time drummer! I must say this was not a hard choice, because we have known Pavulon for years and always admired his dedication to the music and development he has made being in groups such as CRIONICS, VADER, DECAPITATED and ANTIGAMA. Having played a couple of shows together, we now strongly feel that he is the right man in the right place. I have no doubt that his drumming skills will bring in some extra power to our live sound as well as new songs. He will be appearing on the upcoming album, which will be followed up with more details soon. "We have been working on the new material for months now and I am hoping we get in the studio by June and start tracking. "In a few days, we start European tour with KAMPFAR. Remember not to miss that! "To sum up, I want to say we have long needed some new blood and energy and finally we got it. Now I am looking forward to the challenges that lay ahead to make HATE shine brighter than ever!" HATE will take part in the Spreading The Plague MMXIV Tour, which will hit Europe in March/April. 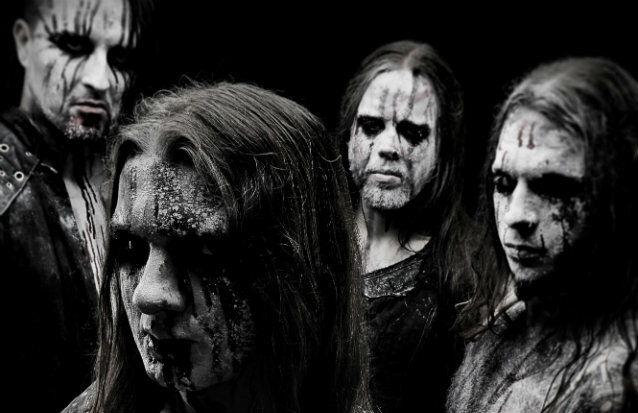 The band will team up with Norway's pagan black metal horde KAMPFAR to bring supreme blasphemy to 16 cites of Euroland. On the tour, which will start on March 28 in Munich, Germany, you will also see U.S. avantgarde black metallers VELNIAS and Norwegian melodic black metal act ISKALD as part of this prime tour package. Commented Adam "ATF Sinner" Buszko: "We are very much looking forward to touring Europe again and I think the combined lineup for these shows is simply killer! As we are working on new tracks right now, you may expect some brand-nu-blaspehemy played on the upcoming shows for the first time! We've been waiting for a regular tour since the tragedy happened and I believe the time has come to hit the road again at full force. We will come back rejuvenated and hungrier than ever before, so be prepared for truly riotous shows!" HATE's latest album, "Solarflesh", was released in North America on February 5, 2013 via Napalm Records. The follow-up to 2010's "Erebos" was recorded at Sound Division Studio in Warsaw with Filip "Heinrich" Halucha (VESANIA, DECAPITATED) and Arek "Malta" Malczewski (BEHEMOTH's sound guy). The effort was mixed at Hertz Studio in Bialystok, Poland with producers Slawek and Wojtek Wieslawski (DECAPITATED, VADER).